From the most luxurious Downtown Los Angeles apartments to the splendid homes in the Hollywood Hills and beyond, Angelenos know that Descanso Gardens is one of the most picturesque features of the area, with its beautiful botanic gardens and lovely forests highlighting native fauna. Year round, this is an internationally-renowned place of natural beauty, a great place to take a stroll, relax at the cafe, or catch a live event; this November and December, however, the gardens will be giving Southern California residents even more reason to visit, with their amazing winter display, Enchanted: Forest of Light. If you’re thinking about planning a visit to see what all the buzz is about, we encourage you to read on, because today we’re going into all the details you’ll need to know to have the best experience possible. 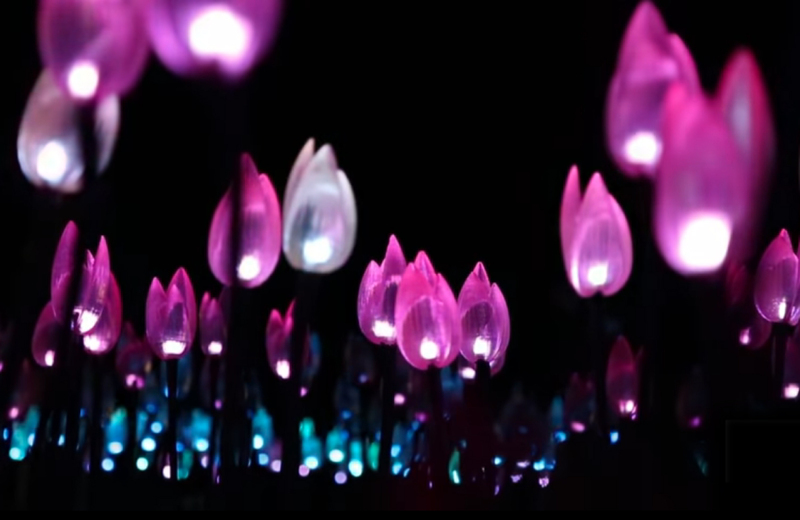 The Flower Power — As you enter the Forest of Light display, you and your crew will be greeted by “thousands of radiant tulips.” A delightful and colorful opening for any show. The Rainbow Sycamores — Head up to these towering sycamore trees, and you’ll have control over the brilliant rainbow lights covering their surface. The Starlight Garden — The crown jewel of this display is the lovely art installation by HYBYCOZO, Celestial Shadows, but that’s not the only part of the Rose Garden worth wondering at, as the glowing stars that lead you in are an equally impressive sight. The Lightwave Lake — Few things are more unique than an electrically-colored body of water, which is exactly what Lightwave Lake offers. You can take control of this color playground and shift bend both the lights and hues to your will, creating your own natural artwork on the water. The Symphony of Oaks — Powerful oak trees are symbols of strength and fortitude, and these mighty, majestic oaks bellow with a “symphony of hues” that emanate from platforms beneath each tree. The Luminous Lawn — This is another display featuring a one-of-a-kind artwork. This time, it’s Aqueous by Jen Lewin, an “interactive landscape of meandering pathways of light.” Pass through the live oaks and camellia forests to gaze upon this amazing installation. The Ancient Forest — A straightforward display, the old forest has been upgraded with built-in sounds and dazzling lights. The Pixel Grove — If you want to enjoy a psychedelic, “Alice in Wonderland” portion of an evening, you can do that at the Pixel Grove, where glowing reeds and prismatic lights put on a show unlike anything you’ve ever seen before. The Garden of Good Fortune — The Japanese Garden at Descanso is now accompanied by hundreds of red lanterns greeting you as you enter the premises. Additionally, you’ll find some of Descanso Gardens’ “Heritage Oak Trees,” mighty old growths dating back to the 1800s, scattered around the park and bathed in brilliant white light. Certainly a sight to behold. What’s the Buzz on This Event? In that regard, it truly does. You’re not going to find many other holiday light shows around the LA-area that do things quite like the Forest of Light. Be sure to snag your tickets from the Descanso Gardens website, and consider the “Maple Reservation” tickets while you’re at it. These will get you a spot at the on-site Maple restaurant, in addition to allowing you to view the show, so if you want a meal with your holiday fun, they’re probably your best bet! Descanso Gardens is but a short 13-miles from DTLA, and getting there is just a straight shot up the highway. The superb location of lovely downtown residences like Eighth and Grand gives you access to all kinds of great events, like Enchanted: Forest of Light, and much more, since they place you right in the heart of everything hip and happening around the city. Sound like your kind of community? Check out what Eighth and Grand has to offer today, and learn more about snagging your very own apartment home among the beauty of DTLA.